Costa Cruises’ new flagship, the 114,500-ton, 3,800-guest Costa Fascinosa, will be officially delivered to the cruise line at the Venice Passenger Terminal on May 5. The ship was built at Fincantieri’s Marghera yard and will be handed over to Costa a day before a scheduled preview cruise. 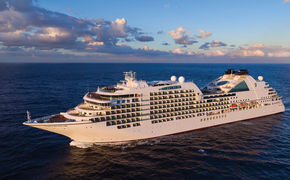 On May 6, Costa Fascinosa is scheduled to depart Venice for Slovenia; Trieste, Italy; and Croatia on a cruise hosting the 19th edition of “Champions of the Sea,” an annual event honoring travel agent partners. Costa Fascinosa then departs Venice May 11 on a 10-day inaugural cruise calling at ports in Greece, Israel and Turkey. Then through November, Costa Fascinosa will operate seven-day cruises from Venice and Bari, Italy, to Greece and Croatia. Costa’s total investment in Costa Fascinosa was 510 million euros (about $671.2 million). Construction of the ship at the Marghera shipyard involved approximately 3,000 workers plus another 7,000 people employed by about 500 contracted suppliers, most of them Italian firms. Since 1990, Costa has invested 5.8 billion euros ($7.6 billion) in work at the Fincantieri, T. Mariotti and San Giorgio del Porto shipyards, with a total of 14 ships built or on order, in addition to the refurbishment of ships already in service. Delivery of Costa Fascinosa takes places just two months after delivery of Costa neoRomantica, the result of the 90 million euro ($118.4 million) refurbishment of Costa Romantica at the San Giorgio del Porto shipyard in Genoa. Costa’s fleet expansion continues at Fincantieri’s Marghera yard with construction of a 132,500-ton vessel that will accommodate up to 4,928 guests, making it the largest Italian cruise ship. The as-yet-unnamed ship is scheduled for delivery in October 2014. The 19th annual “Champions of the Sea” agent event is scheduled for May 6 to 11. Approximately 1,800 travel agents from Europe, North America, South America, Asia and Africa will sail on the new flagship. The Champions of the Sea program includes ship tours, a behind-the-scenes program of technological standards and safety measures, a preview of the 2013 catalogue, meetings with top management and evening award ceremonies to acknowledge Costa’s best travel agent partners based on 2011 results. The ship also will host the singer Noa, who has close ties to Italy and to Costa, having served as godmother of Costa Pacifica. She will perform a concert in Costa Fascinosa’s Bel Ami theater May 6. Fascinosa is Italian for “charming.” The ship’s interiors are designed by maritime architect Joseph Farcus as a tribute to the celebrities and locations that have become icons of charm and seduction in great films and famous operas. The stern lido, dedicated to “Gone with the Wind,” has Jacuzzis suspended over the sea. Another outdoor lido, the Blue Moon, has a retractable glass roof and a 200-square-foot screen where videos and films will be shown.